We love our caffeine. In the US alone, we consume upward of 970 tons of caffeine annually. Caffeine is just a fact in our day-to-day. Sodas, coffee, tea, even caffeinated soap is now a thing. Ok, so we love the stuff. But what exactly is it? In layman's terms, caffeine is a psychoactive drug, classified as a stimulant which effects the central nervous system. When ingested, it reduces fatigue and boosts mental acuity. Caffeine delays muscle exhaustion and increases metabolic rate. Sounds great, yeah? Let's not forget the other side of this. You know the caffeine crash? The headache, crankiness and exhaustion? That's withdrawal. It's the body catching up with being tired and sore all at once. Unpleasant. Caffeine is also super addictive and it doesn't take long to build up a tolerance. Make a daily habit of three cups of coffee and you'll find that after a while you're dragging and want a fourth. We've discussed the side effects of too much caffeine in a prior blog post, and we won't go over that again right now. Let's just say it's dangerous. So there's a brief overview on the effects of caffeine in the human body. Next question is, where does it come from? Caffeine is primarily sourced from plants such as coffee, cacao and tea. It can also be synthesized in a pharmaceutical lab pretty easily (and is frequently done so for painkillers and energy drinks). When not concocted from scratch in a lab, caffeine sourced for sodas can be "naturally extracted" via rinsing coffee beans in a chemical bath (deemed safe by the FDA), then rinsed off and dried until only the crystalline white caffeine powder is left behind. The beans are now sold as decaf coffee and the caffeine powder is added to sodas, meds, etc. A similar process, "water process" decaffeination, yields the same result by boiling the beans in water, then drying the water and harvesting the caffeine sediment. This method also strips all flavor from the beans, so it's not great for salvaging decaf coffee to sell. Most caffeine extraction facilities will choose the chemical extraction approach to maximize profits. Capitalism! Now you know what caffeine does to your body, what it looks like (both on a molecular level and in its visible pure crystal form), but the question still remains: why does it exist? Why do plants contain caffeine to begin with? Fun botany fact: caffeine is a result of evolution to prevent predators. Think about new-growth leaves you've seen. Those tiny, soft, bright green baby leaves? Bugs LOVE 'em. New growth is in terrible danger of being chewed up by pests, which would prevent the plant from growing. Some hardier plants evolved caffeine as a natural insecticide, almost entirely present in the most vulnerable parts of the plant. In tea, 99% of the caffeine in the plant is located in the new bud and the youngest two leaves on the branch. In coffee and cacao it is the beans (they are found within the ripe fruit of the plant). Caffeine overloads the central nervous system so efficiently in insects that it causes paralysis and death. Gnarly, right? 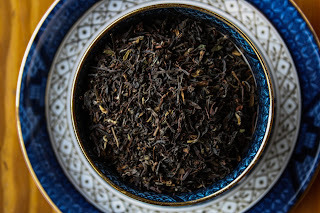 Makaibari Estate Darjeeling, the most potent caffeine we carry here! To sum up: Caffeine exists as a plant's natural defense system against insect pests. It is a psychoactive stimulant drug that can be extracted from plants or created in a lab. 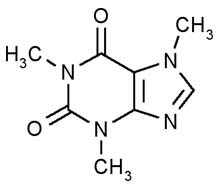 In its raw, extracted form, caffeine is a white crystalline powder, one tablespoon of which could kill a grown person. While it can have great positive influence on focus and energy levels, it is also highly addictive and can cause health problems when overdone. Questions? Any elaboration you'd like? Drop a comment and I'll answer as best I can!